The NYPD's Internal Affairs Bureau is investigating a stop-and-frisk that allegedly turned into a violent pile-on when the suspect dared to ask the officers why they were investigating him. On August 18, a 23-year-old Bronx man named Santiago Hernandez was waiting for a friend on the sidewalk when an NYPD officer, called to the scene for a noise complaint, stopped him and asked to frisk him. A cellphone video of the scene obtained by ABC7 (below) shows Hernandez standing and raising his arms to oblige her. When the search turned up empty, Hernandez asked why he had been stopped. "I'm a person to ask questions," he explained to ABC. "If I didn't do nothing wrong, I'm trying to understand the reason, what they are thinking of me, or what was the reason at all to arrest me." Hernandez says the officer responded to his questioning by slapping a hand cuff onto his arm. Hernandez can be heard protesting in the cell phone video. "I'm like, 'Miss what you doing? You are hurting my arm,'" he told ABC. That's when a half-dozen or so more NYPD officers and a dog arrived and the stop-and-frisk turned into a violent pile-on of punches, pepper spray, and nightsticks. Hernandez was eventually charged with disorderly conduct and resisting arrest, but the Bronx DA has declined to prosecute the case. 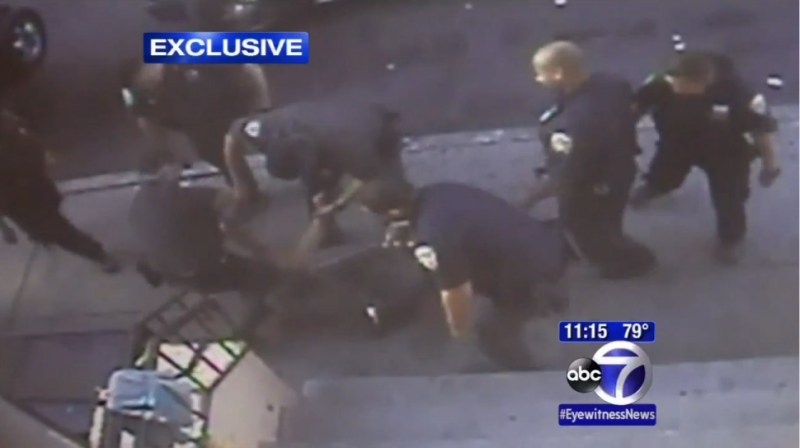 His lawyers are filing a civil suit, and the NYPD's bloody, bloody summer draws on.